The Nine of Cups tarot card, like all Nines within the Minor Arcana, represents a point where we have found our wishes fulfilled, and have completed the projects we have worked for in this path. It represents happiness, fulfillment, and an overall satisfaction with life. Everything has been achieved, and we find ourselves surrounded by our fondest wishes. The Nine of Cups upright indicates that we have achieved our goals, and done so in a way that has left our personal honor intact. It’s not without its problems. As sometimes achieving our dreams comes with complications we had not foreseen. But overall it represents a divine satisfaction with all we have done. Nine of Cups upright is also called the ‘wish card’. Your wishes are going to materialize pretty soon. Only you need to be prepared to withstand the consequences that come along with the fulfilling of these wishes. You will be blessed with emotional stability and inner security. Team work will help you to achieve success. This is a time for you to let down your hair, sit back, relax and enjoy. You tend to share your blessings with others. You will be able to overcome difficulties that crop up in your path and have satisfaction and pleasure. This is the time to reward yourself for all your efforts. You have been living in a time of complete satisfaction, everything has been good and settled, and it’s a joyous time of life for you. It may not be perfect, but it’s as perfect as you’ve required it to be. The recent achievement of the most important of your goals has given you a wonderful sense of completion. So you’ve made it? It’s a new and wonderful feeling, and you’ve worked very hard to earn it. This tarot card showing up is an indicator that you need to celebrate and enjoy these without hesitation. You may have had trouble in the past with this sort of thing, but you’re free to enjoy these now, do so. Good news! The surveyors have returned and have confirmed that the light at the end of the tunnel is not an oncoming train! It is the fulfillment of all your hard work, and it’s just around the corner. Just keep trucking forward, and doing what you’re doing, and you’ll see your dreams fulfilled. Yes! It is in fact time for you to celebrate, it really is as good as it looks! After all your hard work, it’s not an illusion, you really can relax. The Nine of Cups reversed represents a bit of petulance in the person represented. Well, I’ve put in all this work, where’s my gold plated BMW? Why don’t I have that big house on the hill or the fame I was expecting? Or now that I have all these things, why don’t I feel fulfilled? Largely, this is due to our priorities being completely misplaced. 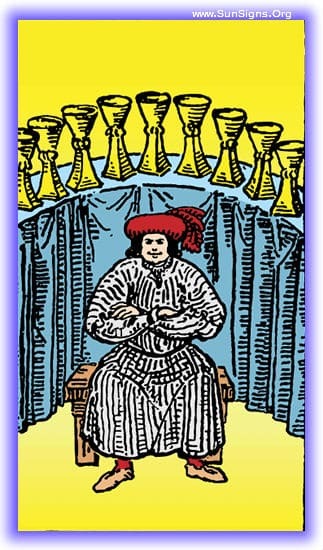 Nine of Cups in the reversed position symbolizes complacency and errors. You will be putting limited efforts to your endeavors. As a result, you would feel dissatisfied as you are unable to do justice to your expectations. You may go through financial crunch due to your spendthrift attitude. To add to your financial woes, you may loose you credit cards too. Your self indulgence as well as pride may also land you in trouble. You are very sentimental and tend to ignore the faults of others. This may cause abuse of hospitality. You’ve been feeling like something’s missing, and you can’t quite place what that might be. You’ve got so many of the things you’ve dreamed about… What’s missing? This feeling will stay with you until you realize your priorities are out of place. 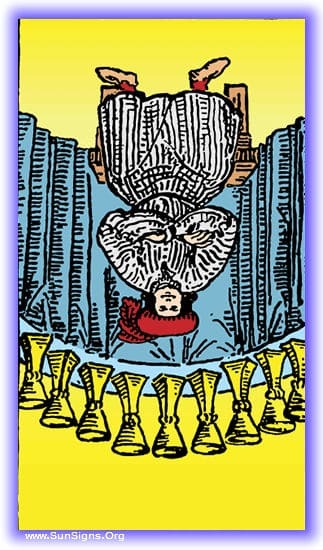 The problem of the Nine of Cups tarot card in the inverted position is actually getting everything we want, and then overindulging in it. It may represent a form of substance abuse problem or merely overindulging in those things that we dearly love. It’s time to get help before it destroys you. Coming down the road ahead of you is the culmination of everything you wanted, but you’re going to be missing out on what you really need. It’s time to reassess your desires. Find out what’s really missing, what’s really going to make you happy. Because you’re about to achieve what you’ve been working for, but it’s not what you really need. No, this really isn’t good for you, it’s probably best if you leave it where it is, and abandon this course of action.